A successful example of transposon deletion via CRISPR/Cas9-mediated genome editing suggests a novel alternative approach to plant breeding. Transposition of transposable elements (TEs) can affect adjacent genes, leading to changes in genetic traits. Expression levels and patterns, splicing and epigenetic status, and function of genes located in, or near, the inserted/excised locus can be affected. Artificial modification of loci adjacent to TEs, or TEs themselves, by genome editing could mimic the translocation of TEs that occurs in nature, suggesting that it might be possible to produce novel plants by modification of TEs via genome editing. To our knowledge, there are no reports thus far of modification of TEs by genome editing in plants. In this study, we performed targeted deletion of the Tos17 retrotransposon, which is flanked at both ends by long terminal repeat (LTR) sequences, via genome editing in rice. We succeeded in targeted mutagenesis of the LTR, and targeted deletion between LTRs, in calli transformed with CRISPR/Cas9 vectors for the Tos17 LTR. 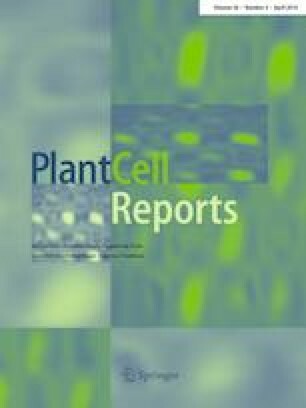 Moreover, we also successfully obtained regenerated plants derived from transformed calli and plants homozygous for lacking Tos17 in the next generation. Taken together, our results demonstrate successful deletion of the Tos17 retrotransposon from the rice genome by targeted mutagenesis using CRISPR/Cas9. We believe that this strategy could be applied to other TEs in many plant species, providing a rapid breeding technology as an alternative means to re-activate expression of agronomically important genes that have been inactivated by TE insertion, especially in plants such as fruit trees, in which it is difficult to maintain parental agronomical traits by cross-breeding due to high heterozygosity. The online version of this article ( https://doi.org/10.1007/s00299-018-2357-7) contains supplementary material, which is available to authorized users. We thank Mr. Masafumi Mikami and Dr. Ayako Nishizawa-Yokoi for critical discussion about targeted mutagenesis in rice; Drs. Tomoki Hoshino and Kazuhiko Sugimoto for providing CelI enzyme and Dr. Helen Rothnie for English editing. We also thank Kiyoko Amagai, Rieko Aoto, Akemi Nagashii and Fukuko Suzuki for technical assistance. This work was supported by the Ministry of Agriculture, Forestry and Fisheries of Japan, the Programme for Promotion of Basic and Applied Researches for Innovations in Bio-oriented Industry to H.S., and the Council for Science, Technology and Innovation (CSTI), Cross-ministerial Strategic Innovation Promotion Program (SIP), “Technologies for creating next-generation agriculture, forestry and fisheries” (funding agency: Bio-oriented Technology Research Advancement Institution, NARO) to S.T.